The Georgian language belongs to the Iberian–Caucasian group of languages. There are 3 dialects in the Georgian (Kartvelian) language, Georgian, Svan and Mengrelo–Laz. The Georgian alphabet is one of only 14 extant alphabets in the world. The modern Georgian alphabet consists of 33 letters - 5 vowels and 28 consonants. There are no upper or lower case letters. The Mkhedruli script it is written in contains as many letters as the sounds in the spoken language, which makes it simple and impressive. The origin of the Georgian alphabet has been an issue of debate among many Georgian and foreign scholars of different epochs. 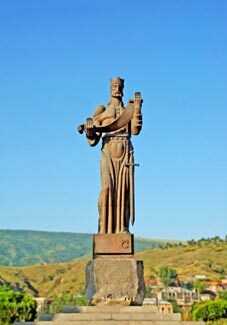 Georgian historical sources date the invention of the alphabet to the pre-Christian period. According to Georgian historical chronicles King Pharnavaz (3rd century B.C.) 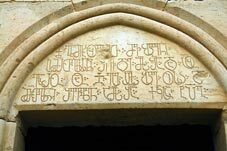 established the Georgian written language. The ninth century Georgian historian Leonti Mroveli (the author of Kartlis Tskhovreba - The Life of Georgia) wrote that King Pharnavaz created Georgian script and then introduced the Georgian language throughout the territories of Georgia. The Georgian alphabet has been modernised over the centuries but maintains its original roots. The modern Georgian script has been in use since the 11th century A.D. It derives from Nuskha-Khutsuri (nuskha - cursive hand, khutsesi - priest, monk), the ecclesiastical script, which itself came from Asomtavruli (a capitalised script found in the monasteries of the 4th-5th centuries). A mosaic inscription in the Judean desert in Palestine is the oldest Georgian inscription ever found. It dates back to 433 AD. Bolnisi Sioni Church, situated south of Tbilisi, also has one of the oldest (493 AD) inscriptions in Georgian. The oldest Georgian manuscript (864 AD) is kept in St. Catherine’s Monastery on the Sinai Peninsula.